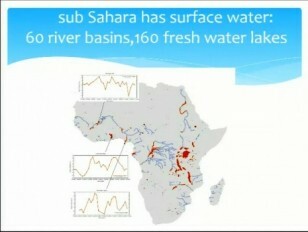 GEOSET » Africa’s future: do water issues matter? View Africa’s future: do water issues matter? What will happen in Africa as water demand increases? Robert Dewar is the recently retired UK High Commissioner to Nigeria and former Ambassador to Ethiopia. Robert drew on his considerable experience of working and living in Africa to discuss the issue of water in shaping Africa’s future. Topics included the geography of Africa and how this shapes its water resource problems, the various environmental issues currently facing the sustainable usage of water in parts of Africa, and those that will be important in the future. The retreat of ice on Africa’s highest mountains, and shrinking lakes suggest the climate is warming in places, and that water may become scarcer in the future. The talk then moved on to potential solutions to some of the issues, including political and technical opportunities. One particularly interesting discussion was the link between improvements to water supply and education benefits for children.